NETWORK FINALS: There were no changes from Friday’s preliminary ratings. CABLE HIGHLIGHTS: A&E’s LIVE PD led Friday cable, up 0.05 to 0.61, with the clip show lead-in at 0.31. Discovery’s GOLD RUSH rose 0.05 to 0.59, and MASTER OF ARMS was up 0.02 to 0.26. ESPN’s NBA game was at 0.58, following a COLLEGE FOOTBALL game at 0.26. On HBO, REAL TIME WITH BILL MAHER gained 0.06 to 0.35, and the season premiere of ROOM 104 was at 0.06 and 0.05/147K . MTV’s RIDICULOUSNESS was at 0.30/0.26, compared to last week’s 0.30/0.23, and TOO STUPID TO DIE was down 0.06 to 0.13. MSNBC’s RACHEL MADDOW SHOW led cable news at 0.30/0.44/3.1M, with Fox News’s HANNITY at 0.27/0.47/3.1M, and CNN’s ANDERSON COOPER 360 at 0.26/0.37/1.4M. HGTV’s MY LOTTERY DREAM HOUSE was at 0.30, compared to last week’s 0.30/0.27, with HOUSE HUNTERS at 0.27, and HOUSE HUNTERS INTL at 0.23. 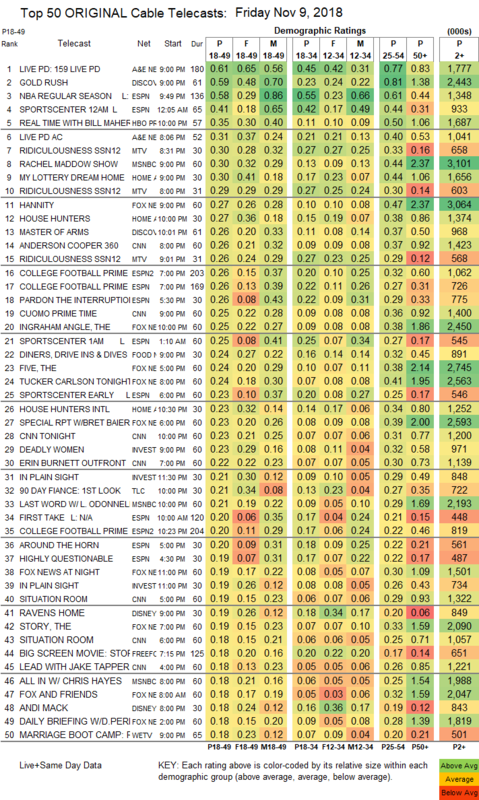 Food Network’s DINERS, DRIVE-INS & DIVES was at 0.25/0.24, compared to last week’s 0.26. On ID, DEADLY WOMEN dropped 0.03 to 0.23, and IN PLAIN SIGHT was at 0.21/0.19, compared to last week’s 0.24. 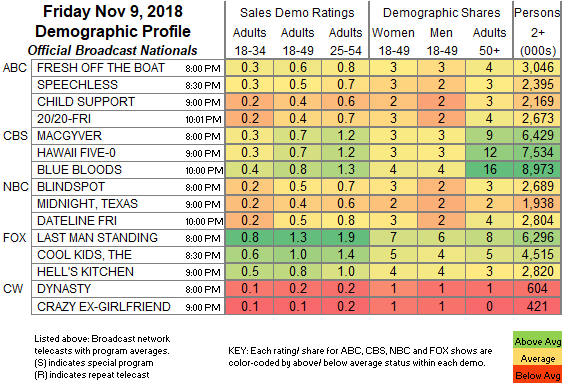 On We, MARRIAGE BOOT CAMP edged up 0.02 to 0.18, and LOVE AFTER LOCKUP was at 0.11. On Syfy, Z NATION ticked up to 0.12, and VAN HELSING was down 0.02 to 0.08.